Perth Vintage Cycles: Bikeville.com - the art of losing customers. The following is my review of an internet vintage bicycle parts store called Bikeville.com. It appears that the site is run by "Ralph" from the Via Bicycle shop which is located in South Street, Philadelphia, Pennsylvania, USA. I am going to share with you my personal experience with the Via Bicycle shop and will let you judge for yourself whether or not they deserve your custom. 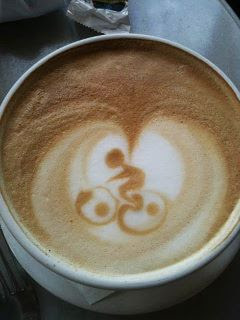 Before I start this post I'll quickly grab a coffee to calm my nerves! Coffee to calm the nerves! I recently acquired a 1972 Raleigh Super Course frame and set about collecting the parts to build the bike. Nice frame, nice bike - great project. I had a look at the original Raleigh specs from the 1972 Raleigh catalogue and tried to collect original parts for the build where I could. When it came to the braking system I learnt that the original 1972 Super Course was equipped with a set of Weinmann Vainqueur 999 centre-pull brakes....so off I went searching for a set. I could get NOS (new old stock) sets on eBay but generally the sets did not come complete with hangers or original Weinmann brake lever hoods. 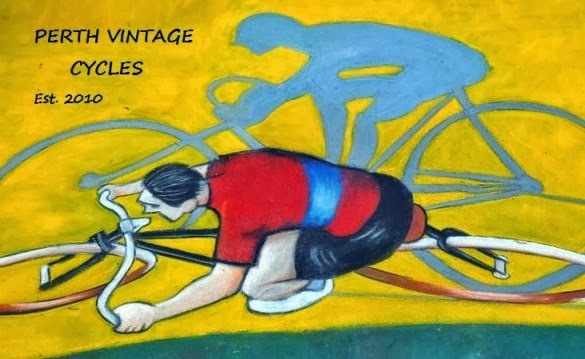 So I set about exploring other vintage bike part stores on-line and came across Bikeville.com (Via Bicycle store). I searched their vintage bicycle parts and located the set I was after. The set pictured on the site had the hangers and the brake levers had Weinmann hoods, all was good! 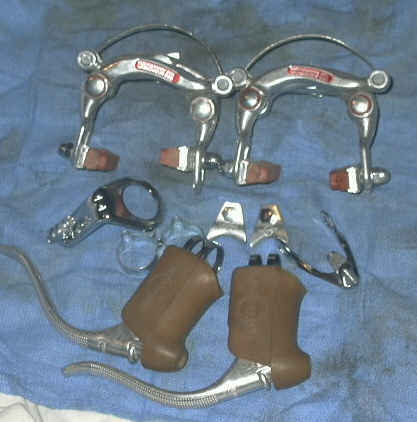 The advertised Weinmann Vainqueur 999 brake set. The advertised price was US125.00, which was fairly expensive.........but the hoods looked good and all the bits and pieces were there, so I was happy to pay this amount to get all of the items in one package. ....so on Feb 15, 2012, I emailed Bikeville.com via the link on their web page and asked to purchase the Weinmann brake set and inquired what the cost of shipping to Perth, Western Australia, would be. On Feb 16, 2012, I received invoice number 201227 from Ralph at Via Bicycle. Great service I thought, very efficient - a reply within 24 hours! The invoice indicated that they had a set and that shipping would be US25.00, so I paid the invoice for a total of US150.00 by Paypal for the items to be sent to Perth. Paying by Paypal is great, very easy, very safe, and the merchant does not receive your credit card details, etc, etc......and after any transaction, all involved in the transaction receive an email indicating the transaction is complete, so I was happy that Via Bicycle had received the money and was aware that payment had been made. On March 6, 2012 (after three weeks of making payment) I had not received advice from Via Bicycle that the item had been posted (shipped) so I emailed them to confirm if they had received my payment of US150.00. I must have missed that it was paid for, sorry. I will get it out today. No problems, I thought....Ralph was busy doing other bike things, it slipped his mind but he's on to it now. So I waited for the package to arrive, and waited, and waited!! Nothing received. On April 19, 2012, (eight weeks after making payment) I emailed Ralph at Via Bicyle to see how things were going. He forgot once, maybe he had forgotten again! It was a polite email asking how the item was sent so I could gauge how much longer it might take to get to Perth. ....but by this stage I was really thinking.......was it posted via airmail, surface mail, via the moon, or squeezed into a bottle and thrown into the nearest ocean! By the way the nearest ocean to Philadelphia is the North Atlantic Ocean which is about a 100km drive, so I quickly discounted this option! After emailing Ralph on April 19, 2012, I did not get a response. ....so I emailed a Ralph again on May 2, May 7, May 11, May 14, May 17, and May 23, 2012. All emails were polite as I thought I would give Ralph a fair chance to respond. I could see that the website was still active as there had been products updated on May 3, 2012, however, I did not receive any response. So there you have it, it's now May 31, 2012, (14 weeks after making payment) and I haven't had any response from Ralph at all, and I certainly haven't received my brakeset! Firstly, I hope that Ralph and his family are all in good health. If this is the problem I accept the delay and have no complaints. I will also be understanding if Ralph has closed his store or if ownership or management has changed. So now you've learnt of my experience.....would you purchase vintage bicycle parts from Ralph at Bikeville.com?? This is a typical internet purchase gone wrong. The buyer is genuine, but the seller is not so genuine. The seller knows that the buyer is too far away to take any action and so pockets the cash without fear of reprisal. Emails from the buyer to resolve the issue are ignored and so......the problem goes away. Thanks for your help Ralph! On February 15, 2013, I was lucky enough to receive an email from Ralph who apologised for overlooking the sale. Ralph kindly refunded the outstanding amount to my Paypal account. Thanks Ralph, all is forgiven. Hi james did you ever resolve the problem with Bikeville and either get your money or the product? Still no response from Bikeville, no product received and no refund. Thanks for your interest. It's nice to hear that my post saved another customer from being mistreated by such careless operators. Thanks for your advice and I'll submit a complaint to the Philadelphia Consumer Protection Office in the near future. I also paid for my transaction by Paypal but my patience let me down. I waited to receive the items beyond the 45 day claim period and could not make a claim although I still lodged a complaint for their records. I'm glad that you resolved yours within the 45 day claim period.